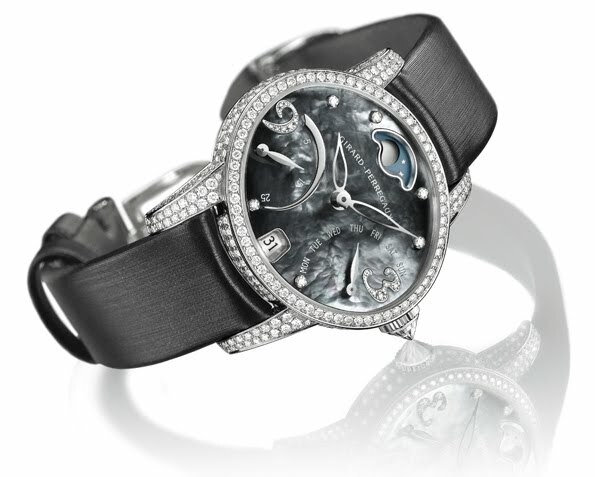 Ever since its launch in 2004, the Cat’s Eye collection by Girard-Perregaux has exercised its potent charm on women around the world. With its seductive femininity and strong personality, it also offers women subtle technical complexities rooted in Switzerland’s grandest horological tradition. Girard-Perregaux Cat’s Eye Bi-retro model features a black mother-of-pearl dial with retrograde hands for seconds and days of the week, and a date window at six. Fashioned in gold and usually embellished with diamonds, it is further enhanced here by a diamond-set crown and a silky strap.